Research has demonstrated that the skills involved in acting and the theatrical arts help close the achievement gap, improve academic skills, and advances students’ motivation to learn. Students who study the arts also learn important life skills, including collaboration, imaginative thinking, decision-making, organization, visualization, empathy and tolerance. Story Theater Company provides several workshops each summer tailored to different age ranges. 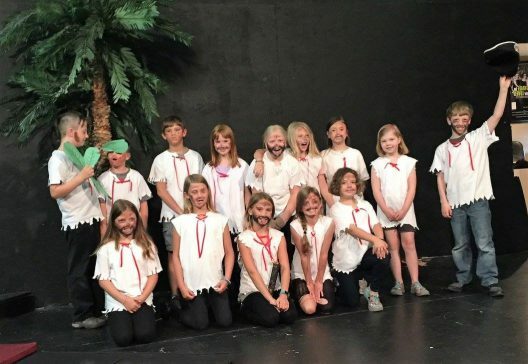 STC’s summer programs are one-week session in which students develop skills in the theater arts while building self-confidence in a safe and fun environment. Classes are developed by professional educators and led by a staff of top Performing Arts students and recent graduates from Iowa State University. Classes can fill very quickly. Class size is limited to keep the classes enjoyable for your child and maintain a proper teacher/student ratio. Classes are filled on a first paid basis. Grades are based on the grade the student will enter in Fall of 2019. Registration begins on March 1, 2019. Early bird discounts available through April 30. This half-day workshop is a perfect introduction for young theater artists. With a focus on creative exploration, we’ll discover a few basic acting ideas through games and activities. We’ll also get to do crafts, play with a little music and movement, and imagine all sorts of underwater things together in the spirit of Marcus Pfister’s beloved classic, The Rainbow Fish. This workshop includes a brief sharing time for parents at 11:30 am on Friday. Monday – Friday, 9 am–noon. While visiting an art museum with her Grandma, Katie finds unexpected adventure when the paintings come to life! In a quest to help the Mona Lisa rediscover her smile, Katie crosses paths with a princess, a lion, a dragon, and more. Based on the book Katie and the Mona Lisa by James Mayhew, this workshop will explore basic acting and staging techniques. Get ready to flex your imagination! NOTE: This workshop includes a free matinee performance of STC’s production of Mary Poppins JR. This workshop includes a brief sharing time for parents at 3:30 pm on Friday. Monday – Friday, 9 am – 4 pm. In the picturesque kingdom of Parmesan, a large stone lies in the middle of the road. What sort of characters might travel past it? What might they do about it? Should they do anything? Join us in telling this humorous story, and build your creative performance skills along the way. We’ll learn about themes like plot, character, and staging as we work together and have some fun. This workshop has reached capacity. This hilarious script by Patrick Greene invites a host of unforgettable characters (mostly feline) onto the stage in an entertaining talk show. Brief Interviews With Internet Cats features cardboard boxes, scaredy cats, and a random commercial or two–plus more. From stock characters to comic timing, this workshop will explore many aspects of theatrical humor. And whether you’re new to the stage or have some experience, we’re sure this will be a fun week. This workshop includes a pizza party following Friday's class and a showcase performance for parents at 5:30 pm. Monday–Thursday, 9 am – 4 pm; Friday, 9 am – 6 pm. Adapted from the beloved Disney movie and stories by Rudyard Kipling, The Jungle Book KIDS is chock-full of your favorite jungle characters and songs. This week will provide a fast-paced, fun education in musical theater (singing, dancing, and acting) while we work to stage this 30-minute musical. This workshop also includes a pizza party following Friday's class with a showcase performance for parents at 5:30 pm AND a second performance on Saturday at 2:00 pm. Ever wanted to create an epic piece of theater that never existed before? How about doing it in just a week? With inspiration from music, literature, and visual art, we’ll spend this week devising a unique theatrical performance and the design concept to go with it. Get ready to act, create, and learn new skills in a highly collaborative ensemble setting. From improv to Qlab (what’s that?) and more, this is a workshop you don’t want to miss. What does it look like to "act" a song or "sing" a scene? This is STC’s classic musical theatre workshop with an emphasis on music and text interpretation, healthy use of voice, selection of material, and audition techniques. Each student participates in ensemble pieces as well as solo material, and we’ll finish the week with a cabaret performance. Story Theater Company must receive payment before your child will be considered registered for the class. You may pay online or send a check. Please make checks payable to Story Theater Company and send to Story Theater Company Summer Workshops, P.O. Box 436, Ames, IA 50010. If paying by check, payment must be received within two weeks or the registration will be canceled. Story Theater Company reserves the right to cancel classes due to insufficient registration. Please review the Workshop Handbook and Registration FAQ before you register your child for any classes. The staff of Story Theater Company have high standards for the behavior of any participant. Disruptive behavior may result in a participant’s dismissal from the program at the sole discretion of the instructors with no refund of registration fees. Workshops will be held at Story Theater Company, 615 South Dayton Avenue, Suite 133, Ames, IA 50010. You can contact us for more information at manager@storytheatercompany.org.